OGDEN, Utah — Rachael Weatherly is a senior adviser for the Federal Emergency Management Agency, but she’s considering trying to get a job at a grocery store. Weatherly is among the 800,000 federal employees who aren’t getting paychecks for the first time Friday because of the lingering government shutdown. Weatherly, a Maryland resident and mother of two young children, said a recent separation from her spouse drained her bank account, and she’s just beginning to re-establish her savings. She can’t afford to miss one paycheck. Roughly 420,000 federal employees were deemed essential and are working unpaid. An additional 380,000 are staying home without pay. While furloughed federal workers have been given back pay in previous shutdowns, it’s not guaranteed that will happen this time. In Massachusetts, a private group has stepped up to ensure that those working at local Coast Guard stations have access to food and clothing during the shutdown. Don Cox, president of the Massachusetts Military Support Foundation Inc., said the nonprofit group has opened up what he calls “empowerment centers” at Coast Guard stations in Boston and Providence, Rhode Island. The group is helping feed 500 to 600 families a day during the shutdown, about double the typical demand, Cox said. He said he’s happy to help but angry that those working on some military bases aren’t getting paid. 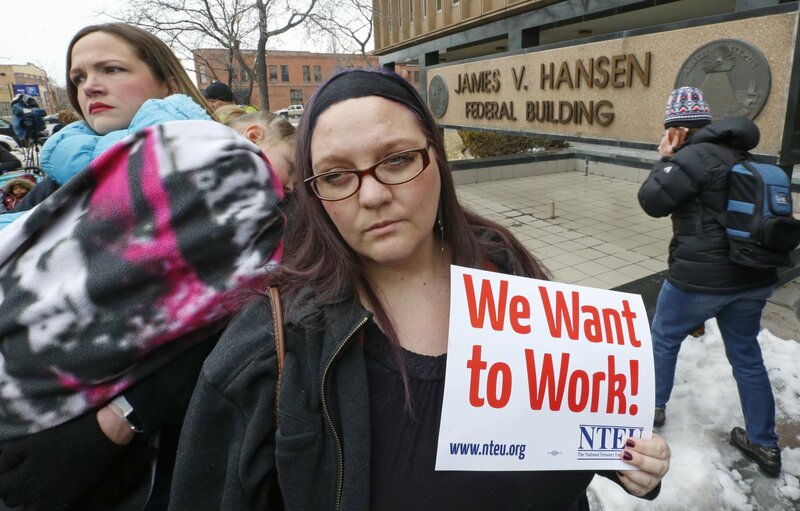 Tiauna Guerra, one of 3,750 furloughed IRS workers in Ogden, Utah, has been trying to get a job but said employers don’t want to hire her when she explains her situation because they don’t want to lose her in a few weeks. Michelle Wallace, a 34-year-old mother of four, told her 16-year-old son that the family couldn’t go to his basketball tournament an hour away from their home in the Peoria, Illinois, area. Wallace, a nurse fresh out of school and strapped with student debt, realized there would be no last-minute deal to end the shutdown, meaning her husband, a federal worker, would miss a paycheck. They couldn’t afford to buy tickets or use the half-tank of gas it would take to get to the tournament.